It's not an enormous collection, but I'd call it reasonably solid. 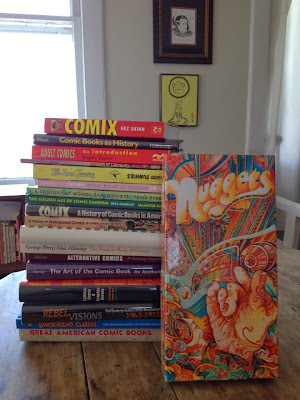 Any of the libraries I had access to as a kid, even the big college campus libraries, only had a dozen books at most about comics. And even many of the libraries I've been to more recently tend to have no more than 40 or 50 books about comics. (The have plenty of examples of actual comics, though!) There are obvious exceptions to that, of course, like the Billy Ireland Library & Museum on Ohio State Univeristy's campus, and the libraries at Michigan State University and Columbia University are impressive as well. But my point so far here is that there isn't tons of material available to a general reading population. What is available has grown exponentially in the past decade or two, but many of the earlier works had very limited print runs. And there's just not a good place to get a solid bibliography of books to even look for. Tom Spurgeon has the best list I've seen, but it wasn't at all difficult to find a dozen books on my personal shelves that aren't listed there. ... I was irritated to see that I only have two of the books from this stack. In fact, I hadn't even heard of about a third of them. This certainly goes a long ways toward explaining why undergrounds are such a gaping hole in my comics knowledge, but it's still kind of maddening to see how much there is out there that I don't even know about. But at the same time, that's a pretty cool place to be. That it is "out there." There's a half dozen books there exclusively about underground comix. You don't have to go digging through obscure acadmic journals or mimeographed, falling-apart fanzines to read about this stuff. It's there for the taking, if you know where to look and what to look for. There's still not a handy list that I can find, but an "underground comix" search on Amazon turns up a fair number of these pretty quickly. I wonder if what we need is a good public curator for this type of thing. I mean, there are folks out there with library sciences degrees with a deep interest in comics, and they are doing some phenomenal work. (Shout out to all the folks at Billy Ireland -- particularly Lucy and Jenny as head curators, and Caitlin with her fantastic PR work -- and Karen over at Columbia who's been been really bringing her A-game to the table the past several years.) These folks are helping all the great researchers out there find materials to put together all these brilliant books. But this public curator thing I'm thinking about -- I'm thinking this would be someone with a broader, more public image. Someone who could direct people besides researchers and academic types to some of these more "conventional" sources. I don't know who this person might be, or how they might gain enough popular support to get to a level like Tyson has achieved. But there is plenty of material out there by plenty of different people to show that we're not working in the relative isolation tanks that Jerry Bails started in. When you start getting die-hard comics researchers still discovering decades old books like this, I think we really could use someone who can stand up and act as a central beacon. Seriously though, I really enjoy these well thought out essay posts. Thanks for all the hard work! Eric... I SECOND that nomination. Seriously, If you'd like, I'll send you the bibliography I compiled during my Graduate work. There may be one or two titles of interest to you.. Thanks for the votes of confidence, guys, but I have all the charm and charisma of the intestinal flu. I do okay embedded deep within the industry; I'm pretty sure I'd turn more people away from comics than not, though. Frank, I'd love to see your bibliography if/when you're willing and have a chance to share it. Cheers!